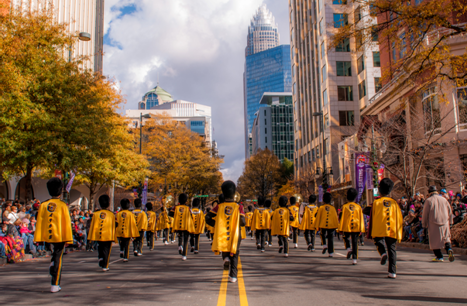 The Novant Health Thanksgiving Day Parade has been a holiday tradition in Charlotte since 1947. For nearly seven decades, hundreds of thousands of participants, volunteers, sponsors, families and friends have centered their Thanksgiving traditions around this parade. While in Charlotte, students can take in a performance at the Blumenthal Performing Arts Complex or take a stroll through the Daniel Stowe Botanical Gardens. The Discovery Place Science Museum with its interactive science lab and deep sea aquariums is another student favorite. The Historic Latta Plantation and Nature Preserve is a living history farm and house museum, circa 1800 cotton plantation, located within Latta Plantation Nature Preserve. School groups visiting the site are able to participate in unique interactive historical programming, visit rare and endangered breeds of historic livestock, see the process of growing short-staple cotton first hand, and visit the honeybee exhibit, and much more! Lastly, the famous North Carolina Music Hall of Fame, is only 30 minutes from Charlotte, and a must see for Music Students. With inductees from the Chairmen of the Board, George Clinton, James Taylor and John Coltrane to Fantasia, Eric Church, Clay Aiken and Victoria Livengood, the North Carolina Music Hall of Fame, is a great destination for music lovers travelling to the Charlotte area.